Most porch or vertical platform lifts are designed for and used in permanent applications where they are bolted to a cement pad however there are a few applications where portable units are preferable. Portable vertical platform lifts to allow occasional access to a stage or bleacher in applications such as schools, arenas or auditoriums. These portable porch lifts can be moved by truck or trailer from location to location or building to building as needed for special events. The PL-P was engineered for stages, courtrooms, schools and other such venues where the need for access occurs only occasionally. It is equipped with removable wheels, making it easy to position and lock into place for use, and easy to move out of the way when not required. Each Porch-Lift undergoes rigorous testing for quality assurance prior to shipping. They fully comply with ADA accessibility guidelines. In fact, more architects and building owners trust the Porch-Lift product line. Durable powder coat finish, making it weather resistant. The AmeriGlide Atlas Vertical Platform Lift-Portable Package is a great solution for those lifting applications that don't require permanent installation, with the ability to store the lift when not in use. 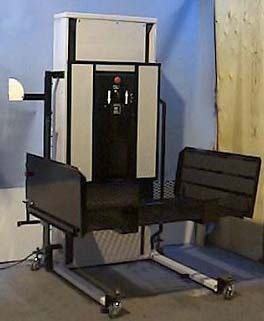 From church pulpits to outdoor stages, the portable version of the AmeriGlide Atlas Vertical Platform Lift can be a safe, comfortable and convenient way for persons with disabilities to access places that were once unattainable. It is designed to meet U.S. and Canadian safety standards and can easily be adapted to various situations including residential to commercial* applications. The AmeriGlide lift's smooth and quiet performance makes this a dependable and versatile unit. *For commercial applications please consult your local elevator branch for approval before beginning construction. Code requirements can very greatly from region to region. 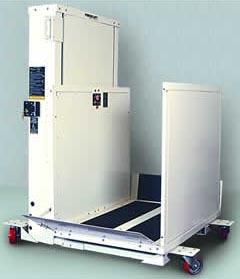 The AmeriGlide Atlas Vertical Platform Lift is completely pre-wired, plugs into 110v / 15a wall outlet. Straight though platform is 54" long x 34" wide. Innovative soft touch control pads for ease of operation. The Mobilift CX is an Economical, Manually Operated lift that facilitates disabled access over Stairs, to Stages, as well as Bleachers. The Unique Manual Operation of the Mobilift permits immediate use, wherever and whenever it's needed. The absence of Batteries, Hydraulic and Electrical Components makes the Mobilift extremely reliable. Since there are no complicated parts to fail or replace, the lift is virtually maintenance free - a yearly component Check is all that is required. With a reasonable purchase price, the Mobilift is an economical way to accommodate special needs visitors at your facility. The Mobilift comes ready for use. Elevates To a Height of 60"
Notice: Information on the MobilityBasics.ca web site is for informational purposes only and not meant to be a substitute for the advice provided by physicians, therapists or other medical professionals. All information is general in nature and may not necessarily apply to everyone as individual needs may vary. For more information see our terms. Products displayed or discussed on this web site are presented to provide examples of products discussed and are not specifically endorsed by mobilitybasics.ca. We do not receive any compensation for displaying or presenting any products.